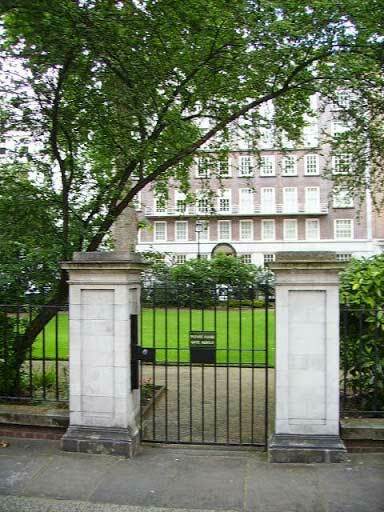 This private communal garden was provided for residents of Lowndes Square, which was developed from 1836 as part of the Cadogan Estate by Thomas Cubitt and Seth Smith. It was once part of the estate of William Lowndes of Chesham, after whom it is named. The garden has original gate piers but the railings date from the C20th. Within are fine mature plane trees, a peripheral path, shrubs around the edge and a central planting feature. Tube: Knightsbridge (Piccadilly). Bus: C1, 19, 22, 137. This is part of the Cadogan Estate developed by Thomas Cubitt and Seth Smith from the 1830s. Having leased land from Lord Grosvenor they drained an area of marshland on the banks of the Westbourne river called the Five Fields, and began to lay out Belgravia. The land of Lowndes Square was once part of the estate of William Lowndes of Chesham, after whom it is named, and had previously been two fields either side of the river. Building of Lowndes Square began in 1836 with the east and north sides built between 1838-49, the west side was begun in 1844; the south side was part of a development by Lewis Cubitt, Thomas's younger brother. The former uniformity of the architecture of the square has disappeared with redevelopment on the north and east sides in the form of mansion blocks. In 1928 described as 'a long narrow enclosure laid out as an ornamental garden with shrubberies and some well-grown trees. Overlooked by dwelling-houses'. They are now surrounded by C20th cast metal railings that are square in section (c.1930).